XanTec bioanalytics specializes in manufacturing high quality sensor chips compatible with all major surface plasmon resonance (SPR) instrument brands on the market. Through consistent research, XanTec has developed the widest portfolio of sensor chips available today, offering tailor-made solutions for almost any application. A) Rigid carboxymethyled dextran hydrogel with single NTA groups with immobilized His6-tagged fusion protein. B) Flexible HC hydrogel forming poly-NTA chelating “cages” for high affinity immobilization of His6-tagged fusion protein. Figure 1. Comparison between NiD (dextran based) and NiHC (linear polycarboxylate based sensor chip coating for reversible immobilization of His6-tagged biomolecules. To make this group of sensitive molecules accessible to FBDD, various attempts have been made to immobilize them reversibly via affinity based His6/nickel-nitrilotriacetic acid (NTA) coupling (Fig. 1). State-of-the-art NTA sensor chips are based on carboxymethyl dextran (CMD) hydrogel modified with NTA groups. Because of the relatively low affinity between the His6-tag and the Ni2+-NTA-complex, continuous dissociation of the ligand from the sensor chip surface leads to unwanted baseline drifts. Such drift effects can easily exceed the specific signal when screening small molecules and thus represent a major problem. Figure 2. Overlay plot of two sensorgrams comparing immobilization capacity and stability of His6-tagged fusion protein (59.7 kDa; AbCam #ab52213) on NiD and NiHC sensor chips. Both interactions were fitted based on a diffusion corrected 1:1 binding model. The immobilization on NiHC shows an approx. 200-fold higher stability compared to the immobilization on a NiD sensor chip. To account for this well-known disadvantage, surface chemists at XanTec developed a poly-NTA sensor chip hydrogel coating based on a strongly hydrated and very flexible polycarboxylate polymer backbone. Compared to the standard CMD-NTA chemistry, these new coatings, which are available in 30, 200, 1000 and 1500 nm thickness, can improve the stability of captured His6-tagged ligands by 2-3 magnitudes, matching the high affinity of the recently-developed Tris-NTA4. Figure 3. Interaction/affinity map of His6-tagged protein A/G fusion protein with mono-NTA derivatized carboxymethyl dextran (top) and XanTec’s poly-NTA sensor chip (bottom). Increasing affinity from the upper right corner to the lower left corner. The affinity map was calculated by association/dissociation rate constants using EvilFit5. 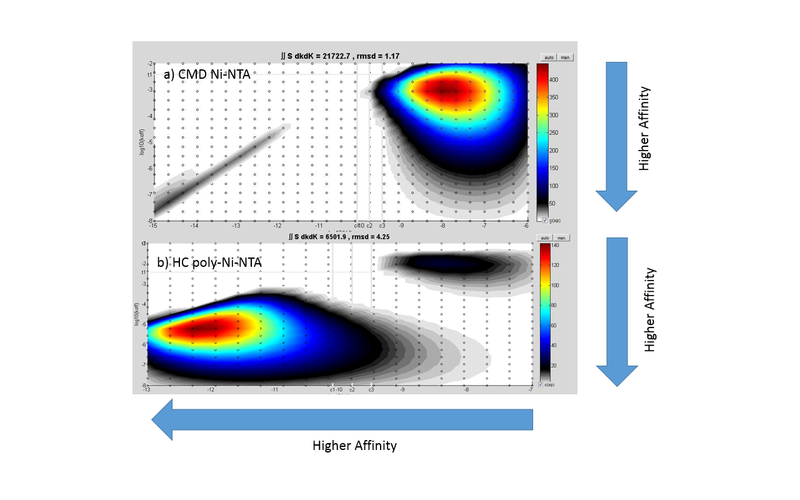 Figures 2 and 3 are showing the much higher stability of a captured His6-tagged ligand (a protein A/G fusion protein) on XanTec’s poly-NTA surface NiHC1000M than on NTA-derivatized CMD hydrogel (mono-NTA). Despite the high affinity of this surface, the regeneration conditions (EDTA) are mild, and identical to those of the standard mono-NTA sensor chips. With XanTec’s unique poly-NTA sensor chips (NiHC group) it is possible to establish higher immobilization levels compared to NTA-derivatized carboxymethyl dextran with the additional benefit of drastically reduced leaching, resulting in a practically drift-free baseline. This allows repeated immobilization of sensitive ligands during extended FBDD campaigns, as NiHC chip surfaces are fully regenerable over many interaction cycles. Faoro, C., Wilkinson-White, L., Kwan, A. H., & Ataide, S. F. (2018). Discovery of fragments that target key interactions in the signal recognition particle (SRP) as potential leads for a new class of antibiotics. PloS One, 13(7), e0200387. Retra, K., Irth, H., & van Muijlwijk-Koezen, J. E. (2010). Surface Plasmon Resonance biosensor analysis as a useful tool in FBDD. Drug Discovery Today: Technologies, 7(3), e181-e187. Shepherd, C. A., Hopkins, A. L., & Navratilova, I. (2014). Fragment screening by SPR and advanced application to GPCRs. Progress in Biophysics and Molecular Biology, 116(2-3), 113-123. Lata, S., Reichel, A., Brock, R., Tampé, R., & Piehler, J. (2005). High-affinity adaptors for switchable recognition of histidine-tagged proteins. Journal of the American Chemical Society, 127(29), 10205-10215. Gorshkova, I. I., Svitel, J., Razjouyan, F., & Schuck, P. (2008). Bayesian analysis of heterogeneity in the distribution of binding properties of immobilized surface sites. Langmuir, 24(20), 11577-11586.